The Model 3004 is a 50 ohm impedance time domain antenna used to make measurements directly in the time domain. 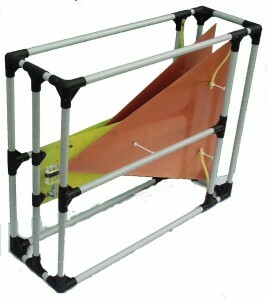 Use of this antenna for transmitting and receiving allows simple calculations of impulse amplitudes and risetimes. This “direct” method of measurement avoids the transformation between the frequency and time domains and minimizes the errors that can arise when basic assumptions are made about a radiating source. We have found time domain measurements to be much more reliable when made with this “time domain antenna”, to eliminate frequency domain conversions. The antenna has a balanced 50 ohms construction to allow maximum bandwidth and minimum reflection, fed with an integral 50 ohm wide band balun to allow the direct connection between the balanced antenna structure and ordinary coaxial line. The good balun prevents off-axis radiation errors from unbalanced currents when used either for transmitting or receiving. The pulse response between two identical antennas is included below and shows a 75.6 PS. risetime followed by a slow decay. One antenna was fed with a 50 PS risetime step function of 5 ns pulse length generated by our Model 732 reed switch pulse generator fed through low loss BFT4 coax for minimal pulse distortion. The very flat top from this pulse generator minimizes additional distortion of the antenna pulse decay after the initial rise. The Model 3004 receiving antenna was fed directly into to a HP 54120A digital sampling oscilloscope through our BFT4 low loss coax. A pulse response through two antennas was 75.6 ps, or for each antenna an individual risetime of about 53.5 PS. The pulse decay through the pair of antennas to 50% amplitude was about 242 Ps. The antennas were spaced 20 feet apart for this measurement and the pulse response would be slightly better at wider separations. The antenna framework is 48 inches long by 39 inches wide by 15 inches high. The complete antenna weighs 22 pounds. We are designing some smaller time domain antennas for smaller aperture use, at closer spacings. We are also designing some larger time domain antennas with higher directivity/gain for use with air propagation or ground penetrating radar. If you require time domain pulse radiation measurements, our commercial time domain antenna hardware, high voltage pulse generators, and high voltage pulse experience is available for you.